THURSDAY, Sept. 21, 2017 (HealthDay News) -- Some people may safely donate blood as often as every eight weeks -- but that may not be a healthy choice for all, a new study suggests. The study was done in the United Kingdom, where experts recommend that blood donors wait 12 to 16 weeks before giving again. That's in contrast to the United States, where blood donations are already allowed at eight-week intervals. 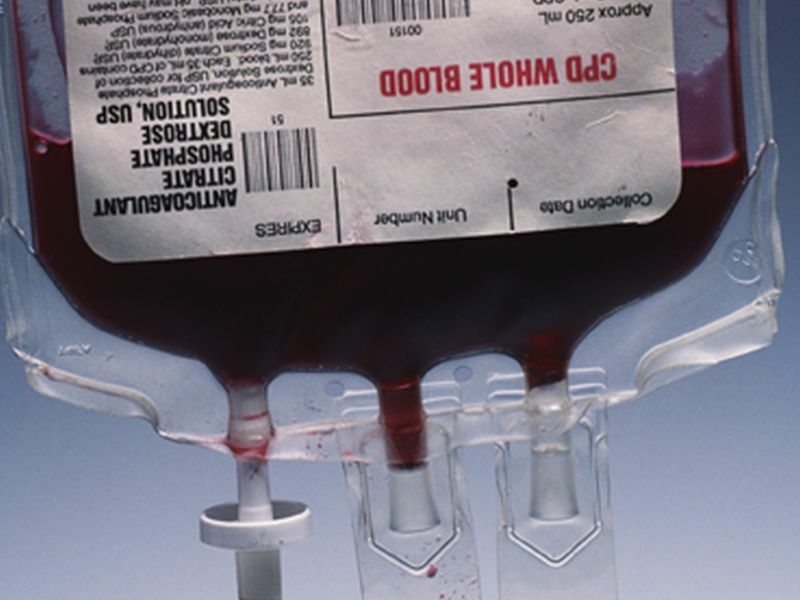 The study -- a large clinical trial involving more than 45,000 blood donors -- was set up to answer a critical question: Do frequent donors suffer ill health effects? The answer, researchers found, was "nuanced." There was no evidence that frequent donations caused "major adverse effects," such as draining donors' physical energy, dimming their mental sharpness or harming their general quality of life. "Frequent," in this trial, meant every eight weeks for men and every 12 weeks for women, over two years. On the other hand, one-quarter of frequent donors did develop iron deficiency by the two-year mark. And some complained of symptoms like fatigue, dizziness and trouble breathing. The study results were published online Sept. 20 in The Lancet. What does it all mean? According to the researchers, the report suggests that strategic use of frequent blood donations could work. "This study suggests that more frequent blood donation is a feasible and safe option for donors in the U.K.," said senior researcher Dr. John Danesh, a professor at the University of Cambridge in England. It could be a good "short-term option" at times when the donor blood supply falls, or demand rises, Danesh said in a journal news release. On the other hand, donating frequently on a routine basis may be needlessly risky, according to an expert who was not involved in the study. "The shorter interval between donations is probably not ideal," said Dr. Edward Murphy, a researcher with the Blood Systems Research Institute, in San Francisco. Blood donors give about a pint of blood each time, explained Murphy, who co-authored an editorial published with the study. That depletes them of about 200 to 250 milligrams of iron, he said. And it takes the average donor about six months to fully recover those iron stores, if no supplements are used. That window shrinks to around 90 days if a donor takes a standard daily iron pill, according to Murphy. Yet the currently recommended blood-donation intervals do not reflect that. In the United States, the Food and Drug Administration has set eight weeks as the minimum for men and women. In France and Germany, men can donate every eight weeks, and women every 12 -- while the United Kingdom has longer wait times. Why? The recommendations are actually "poorly supported" by scientific evidence, Murphy said. And historically, practical concerns -- like maintaining an adequate donor blood supply -- have entered the picture, he said. The new study is the first clinical trial to test the effects of different donation intervals. "That's the innovation of this research," Murphy said. Danesh and his colleagues randomly assigned more than 45,000 U.K. donors to different intervals: Men donated every 12, 10 or eight weeks over two years; women gave every 16, 14 or 12 weeks. At the two-year mark, the donors took standard tests of memory, attention and other mental skills. They also filled out questionnaires on their physical activity habits and quality of life. Overall, the study found, frequent blood donors did just as well on those measures as other donors. But they were more likely to say they'd had symptoms that could be due to donation -- including fatigue, dizziness and "restless legs" (uncomfortable sensations in the legs and an irresistible urge to move them). Those problems affected a minority of donors overall. There was no correlation, however, between those symptoms and depleted iron stores. "That's part of the problem," Murphy said. Donors cannot rely on symptoms to know whether their iron stores have dropped too low. Murphy said some U.S. blood banks have started measuring donors' iron levels, and shifting to longer donation intervals for people who are deficient. Another solution would be to provide donors with iron supplements, he suggested. The typical blood donor probably gives two or three times a year, Murphy said. "But," he added, "there are those people who come back religiously, six or seven times a year." He suggested that frequent donors talk to their blood bank about the risk of iron deficiency, and decide whether they should be tested and/or donate less often.